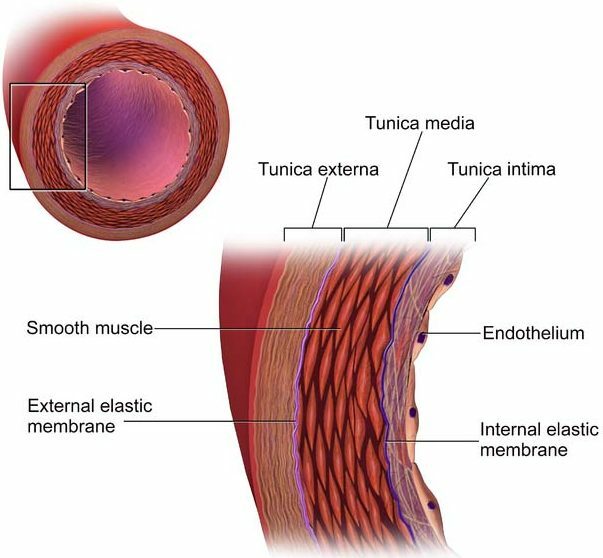 The wall of an artery consists of the tunica intima (innermost layer), tunica media (middle layer), and tunica adventitia (outermost layer). An aortic dissection is a tear in the intimal layer of the aortic wall, causing blood to flow between and splitting apart the tunica intima and media. It can be defined as acute (when diagnosed ≤14 days) or chronic (when diagnosed >14 days). They are more common in men and in patients with connective tissue disorders, and have a peak onset between 50-70yrs. Aortic dissections from the initial intimal tear can progress distally, proximally, or in both directions from the point of origin. 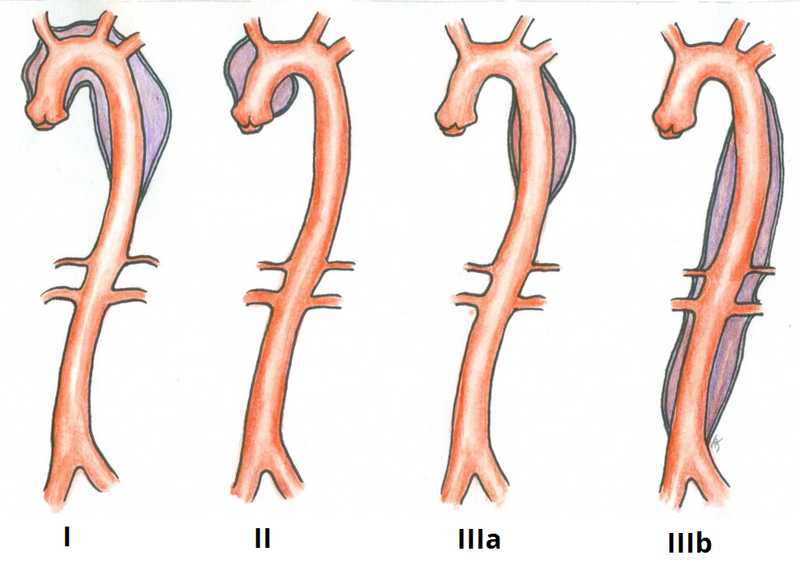 Anterograde dissections propagate towards the iliac arteries and retrograde dissections propagate towards the aortic valve (at the root of the aorta)*. Aortic dissections are classified anatomically by two systems, DeBakey and Stanford. 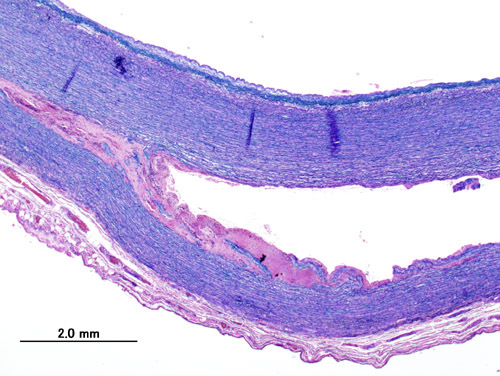 *As a general rule, younger cases often have associated connective tissue disorders, whilst older patients are more likely to have underlying hypertension or atherosclerosis. The characteristic presentation of an aortic dissection is of a tearing chest pain, classically radiating through to the back, yet the diagnosis is often challenging and many be a more subtle presentation. The most common clinical signs include tachycardia, hypotension*, new aortic regurgitation murmur, or signs of end-organ hypoperfusion (such as reduced urine output, paraplegia, lower limb ischaemia, abdominal pain secondary to ischaemia, or deteriorating conscious level). Baseline blood tests (FBC, U&Es, LFTs, troponin, coagulation) with a crossmatch of at least 4 units, in addition to an arterial blood gas to aid initial assessment. An ECG should also be performed to exclude any cardiac pathology. A computed tomography (CT) angiogram is recommended to diagnose aortic dissection as first line imaging (Fig. 4). This will also allow classification, establish the anatomy of the dissection, and assist surgical planning. A transoesophogeal ECHO can also provide useful information but is operator dependent. Urgent initial assessment is required, as for any other critically ill surgical patient. Start high flow oxygen and gain IV access (x2 large bore cannulas); fluid resuscitation should be done cautiously*. *In the setting of a rupture, then the target pressure should be sufficient for cerebral perfusion only. In the setting of an uncomplicated dissection then the target systolic pressure should be kept below 110mmHg systolic. Stanford Type A dissections should be managed surgically in the first instance and carry a worse prognosis than Type B dissections. Any uncomplicated Type B dissections can usually be managed medically. Following initial management, all patients need lifelong antihypertensive therapy and surveillance imaging*, due to the high risk of developing further dissection or other complications. *Imaging would usually be at 1, 3, and 12 months post-discharge, with further scans at 6-12 month intervals thereafter depending on the size of the aorta. Type A dissections carry a high mortality if left untreated and these cases should be discussed urgently with a cardiac or vascular surgeon. They will most likely require transfer to a cardiothoracic centre. The surgery involves removal of the ascending aorta (with or without the arch) and replacement with synthetic graft. If the dissection has damaged the suspensory apparatus of the aortic valve, this will also require repair. Any additional branches of the aortic arch that are involved will require reimplanation into the graft (i.e. brachiocephalic artery, left common carotid artery, left subclavian artery), with long Type A dissections involving the descending and possibly abdominal aorta may require staged procedures. Uncomplicated Type B dissections are best managed medically, with good survival rates. First line treatment is management of hypertension with intravenous beta blockers (labetalol) (or calcium channel blockers as second line therapy). The aim of this therapy is to rapidly lower the systolic pressure, pulse pressure, and pulse rate to minimise stress of the dissection and limited further propagation. In the acute setting, endovascular repair is not recommended due to the risk of retrograde dissection, therefore medical management remains gold standard. Surgical intervention in Type B dissections is only warranted in the presence of certain complications, such as rupture, renal, visceral or limb ischaemia, refectory pain, or uncontrollable hypertension. Type B dissections can go on to be chronic, with continued leakage into the dissection, even if a stent has been placed. The most common complication of chronic disease is the formation of an aneurysm. These present further surgical problems, with endovascular repair offering a better survival chance. Mortality remains high, with over 20% of cases dying before reaching hospital, however early diagnosis, intervention, and blood pressure control significantly improves prognosis. Which of the following presentations is classical for an aortic dissection? What is the gold standard imaging modality for first line investigation of a suspected dissection? Which of the following DeBakey class is defined as a dissection "confined to the ascending aorta"
Which of the following is not a documented complication of aortic dissection?